When Tedd and Janet asked Pete to design the perfect treehouse hideout for their adventure-seeking family, Pete couldn't wait to get drawing! Janet and Tedd's family frequently gathers at their expansive property in Celeste, Texas for recreation and rest. Donning camouflaged clothing, this fun-loving family competes in thrilling games like paintball and capture the flag. The couple thought an overnight stay in a treehouse would be an unbeatable prize for the winners of these games, and would ensure that their family will coalesce to play and laugh for generations to come. Clad in camouflage paint and nestled 15 feet high in a circular grove of hackberry trees, this treehouse blends seamlessly into its surroundings. While it might look tough from the outside, Tedd and Janet's treehouse offers guests a comfortable and luxurious experience inside. With its roomy bathroom, dining area, kitchenette, queen bed, sleeping loft, and multiple decks, this treehouse is fit for champions of the family's gripping games! The host hackberry trees are hardier than they may look, especially with the added support of nine heavy-duty "Frankenbolts." Frankenbolts (named after the bolts on either side of Frankenstein's neck) slide all the way through a tree and support a beam on each side. These ingeneous bolts spread the load of the treehouse, allowing smaller trees to securely support the weight. The treehouse is safe and secure in this brawny grove! Two levels and spacious decks provide sweeping views of Tedd and Janet's 200 acres. Pete specifically designed one of the decks for prime sunset views. During the build, Janet invited Pete and the crew to play paintball with her and her sons. Pete donned a full-sized ghillie suit to better blend in with the environment! The family's love of adventurous games inspired the camo paint job on the exterior of the treehouse. Artist and designer Jason Hulfish painted the camo mural on the whole exterior of the treehouse. With Jason's artistry, the treehouse almost looks invisible in the trees! In the photo above, you might be able to see small, circular cut-outs at the ends of the rafters. The crew added this detail to subtly mirror a lion's jawline - the perfect shape for a treehouse designed for such an adventurous, thrill-seeking family! Can you spot the treehouse?! The camo paint job helps the treehouse blend in, even during the brightest of days. Hackberry tree branches weave through the deck and hog wire railing. Between the bathroom and main interior space lies a small breezeway - it provides space for a refreshing breeze and plenty of shade on those hot Texas summer days. Pete and the crew recycled wood from Tedd and Janet's old treehouse on the property for custom storage coverings and trim. Incorporating this wood was a lovely way to nod to the couple's very first structure on their property! At 34 square feet, this was the largest bathroom Nelson Treehouse and Supply had ever built. The added square footage provided ample storage space. The numbers on the wall are from Janet's horseback riding competitions. Inside, champions can grab a bite at the kitchenette and dining area, snooze in the master bed, or scurry up the ladder to the bedroom loft for rest after an exhilarating game. The crew salvaged the ladder from TreeHouse Point. With two twin beds in the loft and a queen bed on the first floor, this treehouse can sleep up to four proud victors. An air conditioner/heater is tucked away in the nook beside the bed. 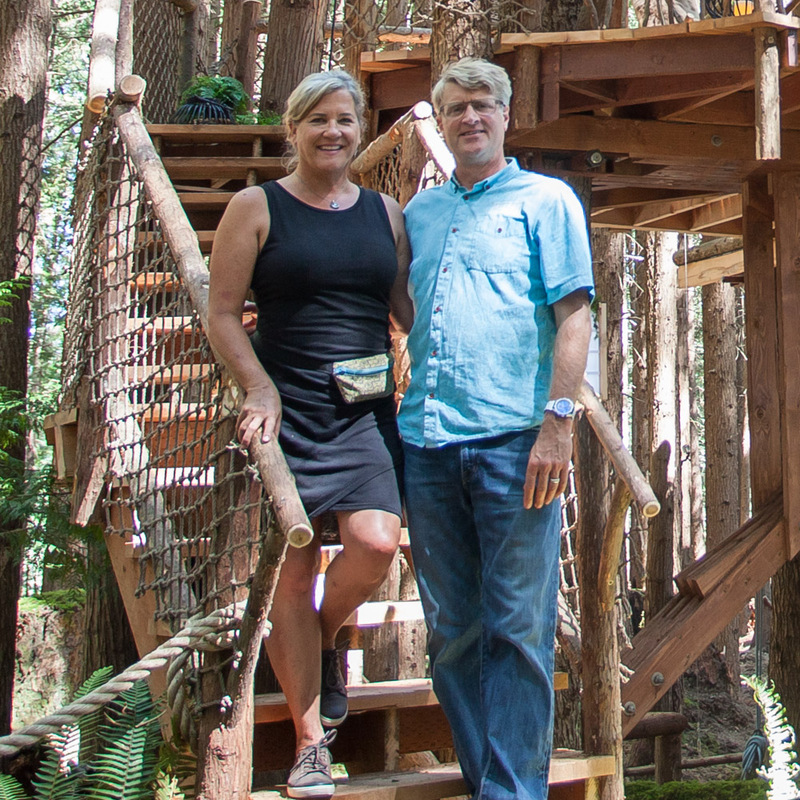 Pete and the crew were honored to work with Janet and Tedd to create this rustic yet luxurious treehouse! They had a blast building, playing, and paint-balling on the couple's spectacular property. Thank you for the happy memories, Tedd and Janet! To stay updated on all things treehouse, follow us on social media and subscribe to our newsletter. To the trees!